Fox News took time out of four broadcasts on Saturday to apologize for four separate instances of incorrect information that portrayed Muslims in a negative light. Several of the cases involved incendiary comments about "no-go zones" in Europe, where Islamic law supposedly supersedes local law and where non-Muslims fear to go. Other media outlets have accused Fox of exaggerations and falsehoods, and even British Prime Minister David Cameron mocked one of the assertions. On Saturday, Fox apologized morning, noon and night. Jeanine Pirro issued the final correction of the day, at 9:10 p.m., for something her guest Steve Emerson said a week earlier: that Birmingham, England is a "totally Muslim city where non-Muslims don't go in." Emerson was ridiculed for his comments, and he subsequently apologized. "Last week on this program, a guest made a serious factual error that we wrongly let stand unchallenged and uncorrected," Pirro said. She went on to say that "the most recent census data, which is from 2011, indicates 22% of the population of Birmingham identifies themselves as Muslim. Also, we could find no credible source that indicates Birmingham is a so-called no-go zone." "No-go zones" have been a theme on Fox. Critics have accused the network of advancing a frightening narrative that demeans peaceful Muslims. Earlier on Saturday, on the morning show "Fox & Friends," co-host Anna Kooiman referred to the previous week's program, when "we showed a map of neighborhoods in France labeled as no-go zones." "Some of the neighborhoods were highlighted incorrectly," she said. "We apologize for the error." 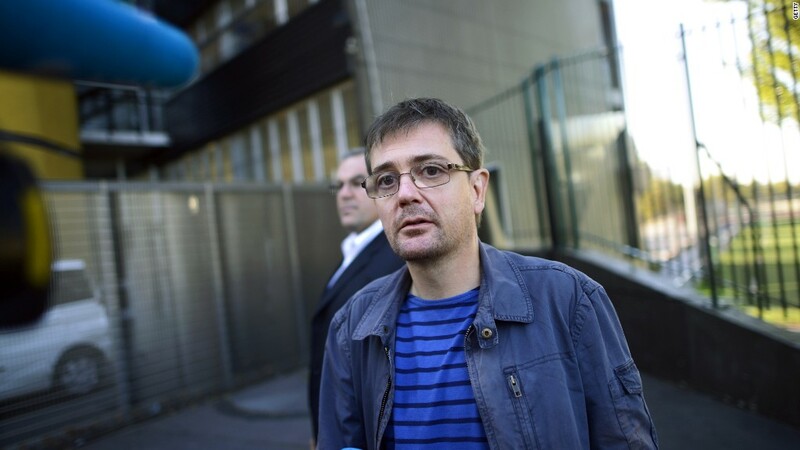 Earlier this week, a French comedy television show observed that the map in question was identical to a map, made by the French government in 1996, of poor neighborhoods in need of help. One of Saturday's apologies was prompted by something said on the network just a few hours prior. An anchor at 1 p.m., Julie Banderas, asked guest Jessie Jane Duff to talk about a poll measuring support for the terror group ISIS in Europe. "The EU poll shows that 69% of the Muslims in France actually support I.S., ISIS," Duff responded. "And not only that, when you look at that same survey, throughout all of Europe, it's relatively very similar, as high as 40% in some locations." That's not true. Eric Shawn, an anchor at 4 p.m., followed up. "We at Fox News have subsequently determined that that poll is not credible, and should not have been used or referred to, and we apologize for that error." Banderas was back at the anchor desk at 7 p.m. And she delivered the most thorough correction of the day -- a blanket apology to "the people of France and England." "Over the course of this last week we have made some regrettable errors on air regarding the Muslim population in Europe -- particularly with regard to England and France," Banderas said. "This applies especially to discussions of so-called 'no-go zones,' areas where non-Muslims allegedly aren't allowed in, and police supposedly won't go." "To be clear," she continued, "there is no formal designation of these zones in either country, and no credible information to support the assertion there are specific areas in these countries that exclude individuals based solely on their religion." "There are certainly areas of high crime in Europe, as there are in the United States and other countries -- where police and visitors enter with caution," she said. "We deeply regret the errors, and apologize to any and all who may have taken offense, including the people of France and England." 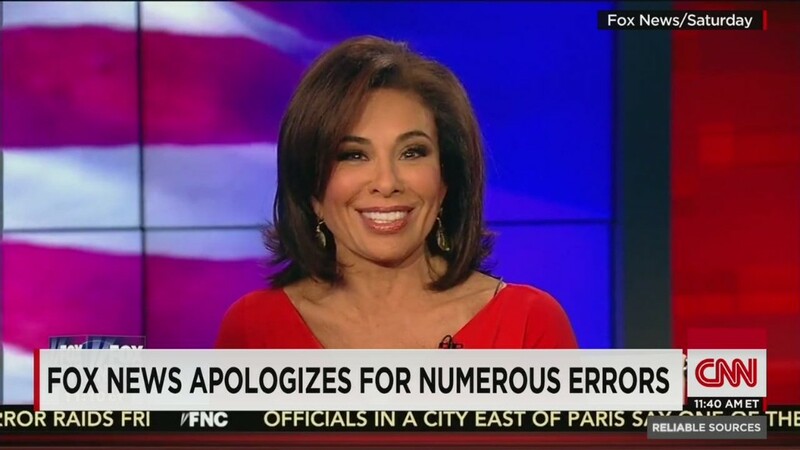 Pirro, on her 9 p.m. show, also said "we deeply regret these errors." Then she encouraged viewers to vote in her show's weekly Internet poll: "Will our free speech suffer so that we can say nothing negative about Islam?"